This photo was not taken while we were existing a concert, but rather a Super Viva Home (similar to Home Depot). 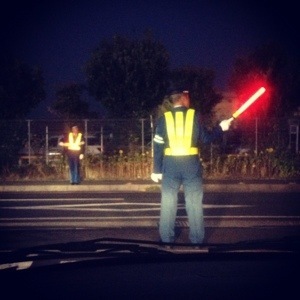 These men and women are all over the major cities in Japan, maintaining traffic order in this cramped country. They may be only directing traffic, but they wear their uniforms well, take their jobs seriously and bow to everyone exiting the establishment. It doesn’t seems to matter how much they get paid or what their job title is, what ever the job may be, they do it to the best of their ability and with their heads held high. This entry was posted in for Fun, Japan and tagged Japan, Japanese, work. Is that a light saber? I don’t think I spelled “light saber” correctly. It seems like a bit of a monotonous job, but it’s a good thing someone does it.